So it has come to my attention that the only Little Busters character without a discussion thread is Komari. That is not daiJObu. Especially since she is kind of an integral part of Refrain, even. Regarding this topic, discussion of Komari route is expected but please put info from other routes (including Refrain) in spoiler tags. Her birthday is the 5th of April. I quite like Komari because she is such a nice person. That whole spiral of happiness thing means a lot and the fact that she volunteers is quite respectable. Her route gives a good insight to dealing with trauma as well. Although I can’t help feeling it was a bit too sudden, the way they dropped the bomb on her route. Does anyone else think so? This is quite a daiJOUbu idea! Her character in all is just a pleasant joyride. I love her so much for what she does in the game and her route was actually satisfying. Komari is just a spiral of happiness, much like the theory with the same name. I’m amazed we didn’t have a Komari topic o.O Shame on me for not noticing. 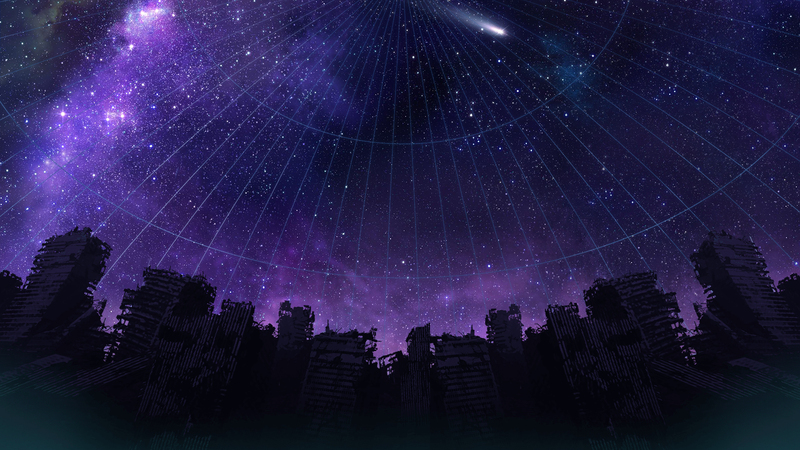 The image you used didn’t really fit with the template we’ve been using, so I put the stargazing CG there instead. I freaking love Komari. A lot of the western fandom seem to look down on her character, but I don’t think people give her enough credit! As a member of the Little Busters, she’s a pretty central gear in keeping everybody happy and getting along. She’s always organizing parties and events, mostly between the girls to help strengthen the bond between the girls in the group. She’s definitely an important figure. But under the surface, there’s something a bit sad about her, too. It seems pretty evident that before she joined the Little Busters, she didn’t seem to have any friends to hang around, instead choosing the solitude of the rooftop as her ‘favourite place’. She’s always shown to be a bit ‘out-there’, so it makes sense that she’d have difficulty making friends, but she never lets it get her down, and continues radiating impossible positivity everywhere she goes, infecting everybody with her spiral of happiness. And I think that’s really admirable. And I think Kyousuke does, too, haha. A boring character? I dunno, to me I find her character really charming. She’s definitely aloof and eccentric, but her ideals are very admirable. She’s not an idiot, she’s just a bit weird. She’s the kind of person I want to give a big warm hug to. I think majority of the reason the western fandom hates her is because they find her voice annoying. At least, that’s the most consistent complaint I’ve heard so far. Also, I definitely agree with you that Blazered Komari looks fantastic. I’ve got this as my current phone wallpaper right now! That’s arguable. You could probably remove every mention of Komari in Refrain and it wouldn’t change much. Nothing important would be changed because of it either. Not even Rin was a big part of Refrain. It was the route of guys. BUT somewhere in there, Kojirou’s story and his loneliness were disappointing subverted. Such sadness. All that said, I do still really appreciate Komari’s passion and Spiral of Happiness Theory, even if in the end they seem like they were just her ways of forcing herself to reject her past. Kamikita Komari is a girl whose smile is as bright as the sun, if not even brighter. She radiates joy and happiness everywhere she goes. As a person, she’s nearly impossible to dislike. Her qualities allowed her to become Rin’s best friend really fast which is, considering Rin’s personality, an incredible achievement. Komari is an expert at enjoying simple everyday things. Chatting with friends, spending time at her “secret place”, the rooftop and, especially, eating sweets (those are like instant happiness potions to her) are the most common examples. While somewhat naive, her spiral of happiness theory does have the potential to make the world a better place if spread well enough. However, there is a dark side to her theory that she might not be aware of: sadness spirals even faster. Especially so for her. She invests a lot into other people and gets really attached, which amplifies her sadness if anything bad happens to them. And this is where her weakness lies. Kamikita Komari lives in a perfect little world with happy things all around. She unconsciously rejects truly bad things (the stuff you can’t heal with sweets and a positive attitude) and doesn’t spend much time thinking about it. The most extreme form of that phenomenon is her Flashback Syndrome. Incidentally, it is implied that her late brother Takuya’s last words are partly responsible for it. "It’s okay. All of this is a dream. …so you can forget it when you wake up. You don’t have to get sad." Her most painful and tragic memories are sealed and locked away. It’s like they never existed in the first place. It goes beyond simple rejection, it’s a self-preservatioin mechanism of her brain that keeps her sane. Because when faced with blood or “death”, those memories resurface with the same detail and increased intensity as when she experienced them for the first time. She then proceeds to denying those deaths by substituting living people with dead ones and talking to them like they were still alive. While this mechanism certainly is keeping her from despairing and losing the will to live on, it’s just a temporary patch-up that’s also keeping her from facing the problem and actually dealing with it. This is reflected in the bad end of the Komari route. If Riki decides to play her dead brother’s role instead of confronting her with the harsh reality, her problem will never get solved. Komari is the type of heroine that makes you think “I want to protect her smile.” As long as she’s happy, her circle of friends will be happy as well. Conversely, if they see her sad, they’ll know there’s serious trouble. Komari and Kyousuke would rival Akio & Sanae for most awesome parents. She unconsciously rejects truly bad things (the stuff you can’t heal with sweets and a positive attitude) and doesn’t spend much time thinking about it. Hmm just wondering about this; was there any other example of this happening? Because if there isn’t, I don’t think we can generalize her personality to be like that. I have a problem with this. See, I feel that she inspires that emotion in people, but it’s to her own detriment. It’s because of people wanting to protect her that she became the insecure mess she is today when she is confronted with death. Riki was perhaps the first to show her that she needs to grow stronger, to develop a smile that even despair can’t conquer. The Komari by the end of her route is a much stronger and more admirable person, (Refrain) as we see in Episode: Rin of Refrain. While it was indeed sudden, I’m totally fine with that. The contrast and shock of that plot twist hit me pretty hard. Part of me was like “Eh? What happened? Why? Someone pls tell me what’s wrong with her I really wanna help her now! !” Her empty-eyes-on-the-rooftop-CG has amplified that effect. Another part of me was already looking forward to the incoming Key drama (Komari route was my first LB route). And now that we’re talking about trauma… I think Key is seriously underestimating trauma. All traumata featured in Little Busters were solved way too easily. That stuff usually takes many years to overcome and there’s no guarantee of succeeding at all. Are you sure? I actually pictured Komari to be really popular - the type that can befriend pretty much anyone. Cute, kind, open-hearted. Aren’t those kinds of people usually popular? And she’s secretly friends with Sasami, too. And I kinda have the feeling I’ve seen Riki call her popular in his narration, but I’m really not sure. Philistines, the lot of them. It doesn’t even take that long to get used to her voice. I’ve seen Natsumi Yanase in several different roles and I can confidently say she’s an amazing VA with a very unique and pleasant voice. And I’m absolutely certain that her voice suits Komari perfectly. I pay a lot of attention to VAs and I seriously doubt anyone could voice her in a more fitting way. I don’t think there was such an example. It’s just the vibe that I got from her before the drama in her route began. Allow me to explain. First of all, her spiral theory is, as I said, really naive. It’s not something a high schooler would normally preach without a shred of doubt. Same goes for her optimism magic (saying “alright!” to motivate yourself). I can’t remember ever seeing her even remotely angry or hurt. It’s like the concept of malice doesn’t exist for her (It’s also different from Kud’s way of thinking in that regard). Then there’s her volunteer activities. To me, it looked like she’s “merely” trying to spread happiness while not being aware of what kind of world she’s entering there. She’s all happy-go-lucky about it, never serious. She never acted like volunteering was important. It’s like she didn’t register that the money she’s collecting is for people who desperately need it (and not just so they can eat sweets), or that the retirement home she’s visiting is basically a dump for old people who were deemed too bothersome to deal with by their families, a place where they’re supposed to wait for deaths. It’s literally their last stop in life. Something just felt off about her. Naiveté and optimism aren’t enough to explain Komari’s behavior and personality (and why her own theories work so perfectly for her). I didn’t get feeling that she’s a character with immense inner strength, capable of overcoming any emotional trouble. It was more like… bad things never happen to her in the first place. Thus, I have concluded that she subconsciously rejects bad things, filtering them out of her inner world. This also connects to what Aspi mentioned. It’s because of people wanting to protect her that she became the insecure mess she is today when she is confronted with death. She’s being sheltered from bad things, so she has zero resistance to emotional problems if they do strike her directly. What other people should have done would be, like Riki, to give her a few nosedives into the things she keeps ignoring. At least that’s how I’ve seen it while playing Little Busters. I’m absolutely certain that her voice suits Komari perfectly. I pay a lot of attention to VAs and I seriously doubt anyone could voice her in a more fitting way. 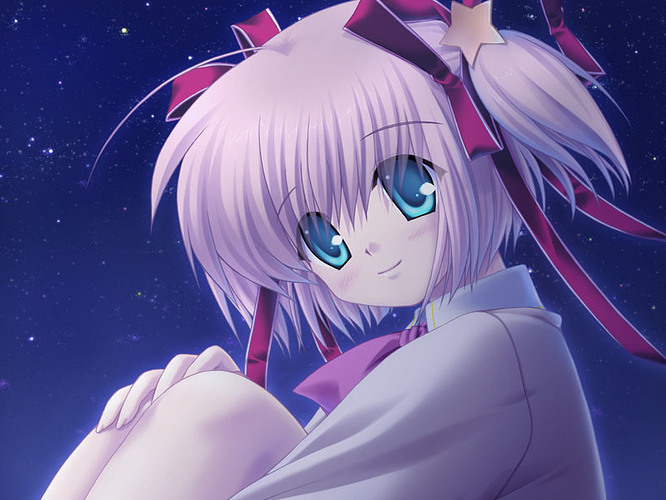 Komari’s was my favorite route besides Refrain. I don’t know exactly why, but it really touched me. I didn’t cry, but I got close. This is why i broke in tears when Rin opened the notebook in Refrain. That was the saddest part for me. But a thing I don’t get: what makes Komari so important? Why is she the cover of some CDs and the cover of the game with Rin? It could have been presented better (the anime did a great job) but she’s like the bread to Rin’s butter. She’s easily the keystone Little Buster to support Rin and break her out of her shell.